I absolutely love a Cannoli and thought, how great would it be to fill a pie with Cannoli filling. This recipe is all about the filling. For my Homemade Pie Crust recipe, the link is available at the bottom of this post. I explain the process of blind baking. Note: You need to bake off the crust in advance. Traditionally you may find a little orange or lemon zest in the filling, I’m going to be using a vanilla bean for this recipe. I adore the flavor that vanilla gives to the filling. You want to make the baked pie crust shell, is completely cooled down before adding the filling. Note: You want to make sure to use a large enough piece of cheesecloth so the mixture can be wrapped completely. The night before, dump both containers of ricotta cheese into a sieve lined with cheesecloth. Place a plate on the top, then a can on top of the plate to act as a weight. The next day, remove the ricotta mixture from the frig, bring to room temperature. Transfer the mixture to a large mixing bowl. Using an electric mixer, on low speed add the seeded vanilla bean and confectioner sugar. Mix on low speed until totally combined and fluffy. Add the semi-sweet chocolate chips, fold into the ricotta mixture. In another bowl, add the heavy cream. With an electric mixer, mix until cream reaches to almost, the stiff peak stage. Fold the whipped cream gently into the ricotta mixture. Place the filling back into the refrigerator for at least 1 hour. Fill the pie crust with the Cannoli filling. 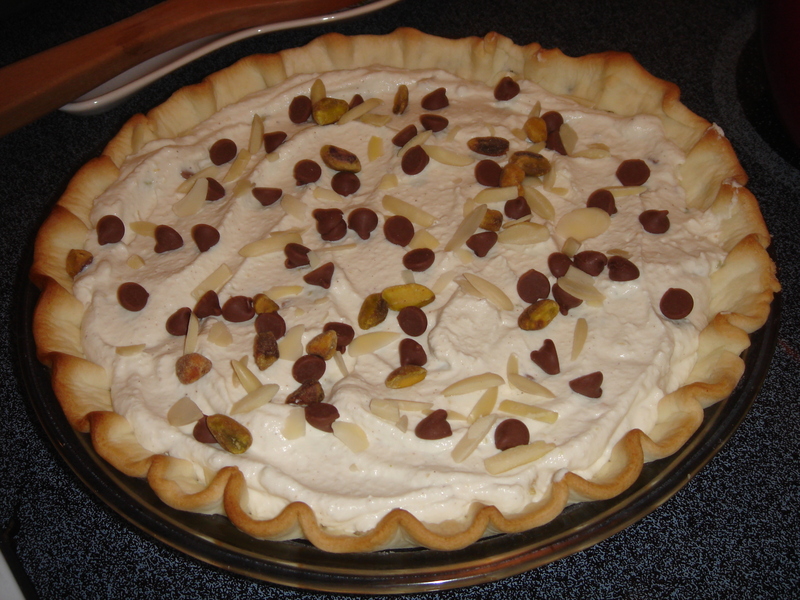 Top with more of the chocolate chips, pistachios, and almonds. Thank you so much. So when you go to my site, on the home page, on the upper right side, you’ll see the menu. Click on desserts. Next, in the search bar at the top type in cannoli pie. If you want to make your own pie crust, type in homemade pie crust into the search bar.